The Sparmax AC27 Airstream Compressor is the most compact and portable of all Sparmax brand compressors. Measuring a mere 6" × 6" × 7" and weighing just 6½ lb, it boasts a powerful yet quiet 1/8 HP motor capable of putting out 8–9 Liters of air per minute at up to 45 PSI. 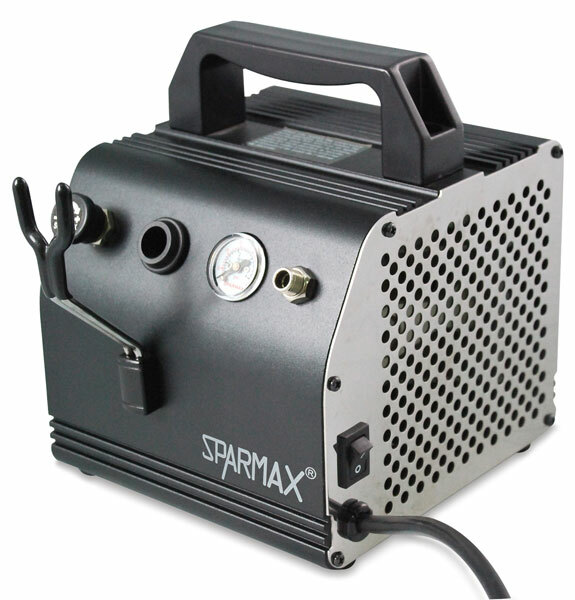 This compressor is ideal for smaller airbrushing projects such as nail and body art, hobby applications, and cake decorating. The metallic copper-colored casing also gives this little powerhouse a very attractive look. The AC27 Airstream includes a fully adjustable pressure gauge, an airbrush holder, a curly airline, and adaptors that let you use it with all major airbrush brands.